Every season, LSV does his color-by-color review of the upcoming set as pertains to a limited environment. While these are always a good read, I’m always more interested in the follow-up geared toward constructed play. Sure, it’s important to know which cards are good in draft, but for those of us who also play constructed, it’s good to know what’s good (or valuable) to walk away with. As such, I’ve gone through the rares of Magic Origins with a similar lens. It seems foolhardy to guess actual numbers, so I’ll be keeping it nice and vague. 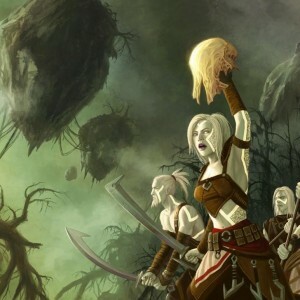 Planeswalkers: keep those. 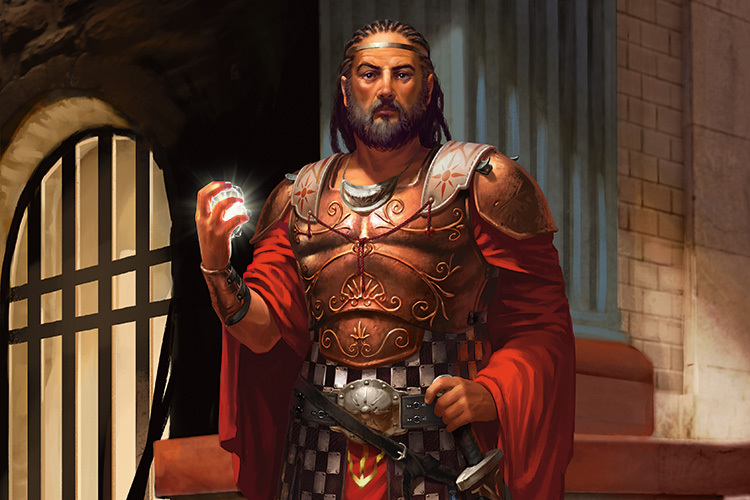 Everyone is talking about how great Gideon is, but from a speculation standpoint, they all have the potential to be played (at least in standard). This card feels strong. Really strong. It has effecient stats for its cost and will likely see play. Feels like a keeper to me. I still don’t know what to make of this card. At face value, this is a five-drop enchantment that has a slim chance of affecting the board the turn it’s played. At its worst, it’s turning your banishing lights into vulnerabilities. I don’t have high expectations for this card or its price. Hixus has a neat effect, but as the rare featured in the white intro pack, his price is never going to stay at anything higher than a dollar. This card costs seven mana. Sure, it puts 8 power onto the board at instant speed, but it’s already outclassed by Secure the Wastes and Empty the Pits. I have a feeling the Spell Mastery will be trinket text, as no one wants to play a seven-mana defensive spell. Hang onto this card. It is extremely playable. Oh, you’re playing Deathmist Raptor? That’s fine. Oh, you’re flashing back Lingering Souls? Fine by me. Trying to cheat out an Emrakul, the Aeon’s Torn? Neato. I’m essentially going to counter that and draw a card. In white. (This is probably my favorite card in the whole set). I wasn’t playing during Alara, so I’m not sure if this card was good then, but from an evaluative standpoint, the flamboyant lion rider comes bearing only upside. It will likely see standard play, so they feel like a hold to me. A vehicle to tap your opponent’s biggest creatures without having to tap itself seems very strong, and its stats are nothing to scoff at. Speculatively though, I’m not positive this limited bomb will be a huge moneymaker. What a great card for all the sweet equipment in standard! Like… Um… Godsend? He’s holding Godsend, right? This is an efficient creature and all, but relying on hitting your opponent for his ability will likely be a drawback on the price frontier. I can’t tell you how quickly I’m going to pair this with Myth Realized. This is already a $4 card, and it historically hasn’t been expensive. So, pricewise, I wouldn’t expect greatness. This card feels very interesting. Immediately, it has very high interest from the EDH crowd, and it will likely see some sort of play in standard once people figure out how best to use it. I’d say hang on to this one. 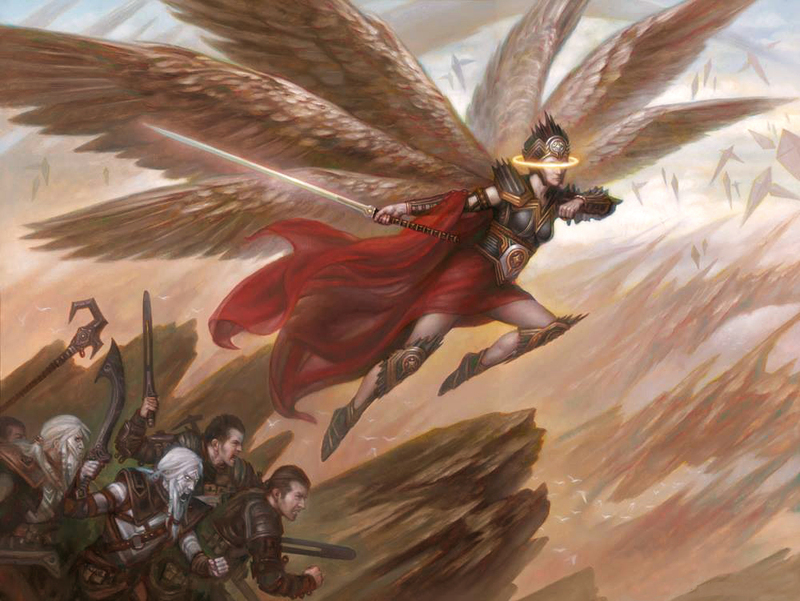 Nonlegendary Thalia traded first strike for flying. You all know that nursery rhyme, right? This will see play in standard, much to the dismay of control players. 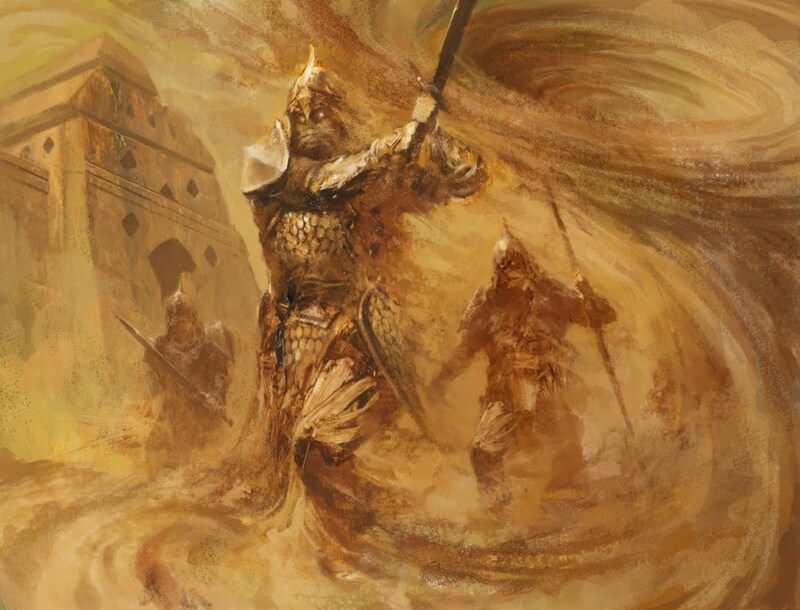 I have big doubts about it in modern because of the sheer efficiency of Thalia, Guardian of Thraben herself. Seems like a card to pick up for the standard price bubble though. She seems full of potential just because you don’t often get a creature like this with modal abilities. I’d be cautious on guessing her price, as she reminds me of a certain mythic Flamespeaker from Theros. This is another card that’s just dripping with potential. I expect someone to abuse this, be it with quicken effects, or something unexpected. I’d pick up at least a playset of these. One of the things that makes Meddling Mage playable is that she costs two mana. Big Sphinx, however, costs seven. Sure, his ability could be construed as a form of protecting himself, but once again, the rares from the intro packs are almost guaranteed not to make you money. Of all the new cards, this might be my favorite instance of Spell Mastery: if you have Spell Mastery, it doubles the effect. I’m confident this will at least make the sideboard of control decks. I’m imagining that hilarity might ensue if you hit an opponent’s copy in the mirror. I’d hang on to at least a few copies. Scaleable cards like this are often used very beneficially. This will always hose an aggro deck, but the sorcery speed gives me pause on speculating price. You know that merfolk deck people sometimes play in Modern? They all want this guy. He’s efficiently costed, and he can come down at instant speed without you having an Æther Vial online. Not only that, but last time we were on Zendikar, there were merfolk. Pick up as many of him as you can. I’m not positive this will see standard play. It does have large appeal to anyone who plays blue in EDH. Likely not going to be expensive. This guy is neat. The single-use Spellskite with flash. I can see him being appealing for budget players who don’t have $20 to shell out for the real thing. With a name this badass, I will be personally insulted if this guy doesn’t command a fortune. I’m not sure on this card. It might be a little expensive, mana-wise, but if an artifact deck emerges, giving them all curiosity and replenishing the air force will be a powerful effect. Could be worth picking up for speculation. I personally don’t like this card. It doesn’t protect itself, it costs 5 mana, and usually, when I’m targeting something, it’s dying. I don’t have high hopes for the Willbreaker. I love that my favorite god got a shout out in Origins. Not only that, he’s pretty good. I’m optimistic on this guy’s price. You can make all the deals with the devil you want, I still don’t see this ever being an expensive card. This fellow is where the “intro pack rares are worthless” mantra falters. Yes, he is the face of the black intro pack, but he’s actually pretty cool. 6/6 for 6 with flying and upside? I think he may see play, but his availability will cause his price to suffer. “I’ve got an idea: let’s put Demonic Tutor and Dark Ritual on the same card! Flavor win!” Unfortunately, the major appeal of both of those cards is that neither requires the startup cost of having 5 mana. For that cost, I can play Sidisi, Undead Vizier and get the tutor attached to a significant body. Pessimistic on price. This freaky little horror has the potential to be a rock star. He’s an efficient attacker that keeps coming back. And, if you’re missing the glory days of mono-black devotion, you can pair this guy with a Titan of Erebos and for a few months, baby, you got a stew! We’ll have to see how the elf decks shape up. This guy will either be too expensive (doesn’t get hit by Collected Company), or he’ll top the curve nicely. I do like that he affects the board the turn he comes down. Cautiously optimistic on price. I can see this guy and Blood-Chin Rager/Arashin Foremost being best friends. B/W warriors wants this guy, but I’m not sure that’s enough to command a high price. I really like this card. It’s nice and proactive, and it doesn’t need to live in just the sideboard. Would pick up. Is it Damnation? Nope. Does it take care of most problems? Yes. I would get at least a playset of these. I’m a big fan of this card. Totally nerfs an opponent’s lifelink (and not yours) and makes Siege Rhino a sadder, more symmetrical play. It probably won’t be worth much, but a one-sided Rain of Gore isn’t anything to scoff at. This card is exactly what red decks want: a curve-topper that draws extra cards every turn. I can see this guy and Thunderbreak getting along nicely. Would keep these. This is a strong card, and it would be without the prowess. He feels like a sleeper winner to me. Chandra’s parents are efficiently costed up until their ability. Unfortunately, they fall right back into the intro pack slump. “Can’t be countered” is probably the least exciting Spell Mastery bonus out there, but I can see it coming up. This feels like fairly efficient burn (for a standard meta). Worth picking up. Meh. This could easily be a green card, but they made it red instead. Nonplussed. Why do effects like this always end up costing 5 mana? He could end up being cool since his effect applies to any red source, not just your instants and sorceries. Probably not going to be expensive. This has EDH written all over it. I shouldn’t need to tell you to pick these up. I love the design on this card. It’s costed at the bare minimum, and it turns flooding out in red into a burn engine. This feels like a winning card to me. This will be a good card, especially once Coursers and Caryatids are gone. I think she’ll be a sleeper. This feels strong. Even if you’re just tutoring out an Elvish Visionary, that’s still a big advantage and a great value. Expect this guy to be played. Finally, that board wipe all those mono-green control decks have been waiting for… I don’t like anything about this card. It costs 9 mana for a total gamble. I don’t even want this in EDH. This is the other legendary that, like Kothophed, will probably see play but will remain relatively low in price due to availability. Unlike The Great Aurora, this is a card that every green EDH deck wants. 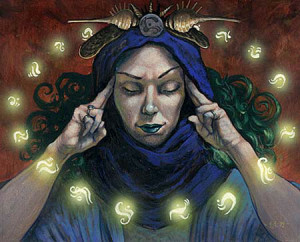 The spell mastery is pure upside and the thinning of your deck can lead to some real advantage. I’m definitely picking up at least an EDH playset. Again with the interesting card design! This is almost guaranteed to give every combat some sort of benefit for you. I can see this being played in most green decks. Sideboard against control? Yes please. This reprint already commands a staggering $1.50, so I wouldn’t count on it being pricy, but I can see its value in the standard meta. 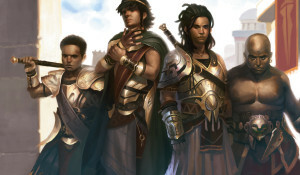 Where were you during Theros? Hiding in R&D, because Courser of Kruphix for GG is pretty busted. This will be a house until Theros officially rotates. Ride that bubble. This guy gets a lot of flak, but that’s mostly because he’s not very good. I’d rather play Leaf Gilder and not have to worry about Renown shenanigans. Pass. At the same CMC as group EDH’s favorite bull, Taurean Mauler, the hydra trades in jiving with tribal decks for good ‘ol trample, making it a real threat. Can’t say for sure if he’ll see standard play, but there’s definitely a market for him. I really like how the art shows a creature known for its CMC of 15, as if to say “look at how good this can be!” 7 is a little steep, but I wouldn’t totally discount this card. Super-efficient stats, but I’m not sure that catapults this giant from limited bomb to standard playable. Unless you can reliably give him trample, I’d ignore him as what will likely be a $1 rare. This card is just beckoning “Play Sphinx’s Rev! Do it!” This might find a home in UW tron in modern, and definitely in most EDH decks, but I’m skeptical about this in constructed. Red only got one mythic, but it got this too. Again with the 5-mana thing. The repeatability of the effect makes this a strong card, but it’s a little pricy mana-wise. At mythic, I’d hang on to this. Sometimes, I like a little Halo 2 while I’m playing magic. This guy is neat. He’s like Scuttling Doom Engine‘s cooler younger brother. Seems usable. I’d pick these up. Efficiently costed as possible, I can see this being played in some Boggles brews as a reliable way to push the damage over the top, as well as something that sticks around after the creature dies. Not sure there’s a place for it in standard, but I know a pretty GW angel from Innistrad who would be happy to wear this during an EDH game. Lot of sevens in this card. That means it’s good, right? This card has bulk rare written all over it. Witchbane Orb that costs 1 extra to give you Absorb 1. It’s a little expensive at 5, but I think this will see play (maybe even in modern sideboards) as it completely hoses token decks. 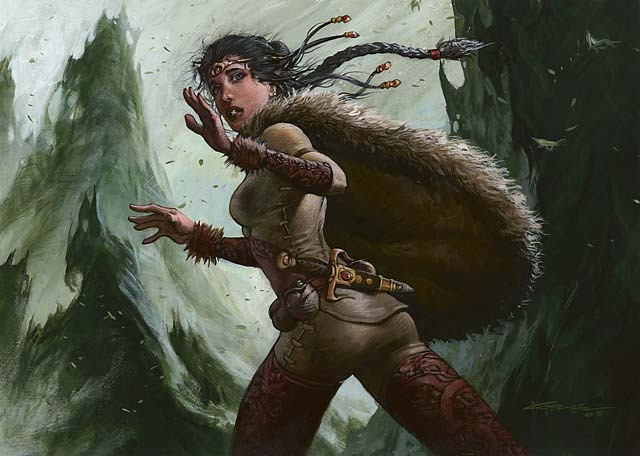 I can just see that scene where Nissa pulls the old “my walking stick has a secret sword” trick on someone. I like this card, and it’ll be even better if we see the return of Landfall in Battle for Zendikar. Very efficiently costed. Would play. This set was very interesting to review from a future financial standpoint with the change of putting all of the non-planeswalker legendary creatures as the flagship rares of the intro packs. Made for a strange price calculation. As you can imagine, it’s much harder to predict the impact on a constructed meta (and thusly a financial standpoint) than it is to evaluate the effectiveness of the cards in a standalone set within a limited environment. Of course, I could be completely wrong on some of these, just like the people who instantly wrote off Treasure Cruise as unplayable. Did I miss anything? Leave your responses in the comments below. This entry was posted in Uncategorized and tagged Languish, MTG, MTGFinance, MTGOrigins, MTGSpeculation, MTGTCG, Pre-Release on July 10, 2015 by Anthony Balbo. One night last week, while I was listing great flavor cards as candidates for the column, it occurred to me. Legendary creatures had the bulk of my attention, and made up the bulk of my list. I crave more balance in our journeys through flavor, here on The Other Side of the Coin. Still, it didn’t surprise me. Legends, by definition, are subjects of age-old stories brought to life. “Legend,” from the Latin “leger,” meaning “to read.” Related words include “ledger,” a book of records; “legitimate,” verifiable through recorded fact; “legible,” possible to read; “legal,” permissible by written law. And “legacy.” Because if you want something to last forever, you tell its story. Still my inner Vorthos was troubled. What kind of stories could I find for creatures that existed in multiples? Or noncreature spells? Legends, while well-loved, aren’t inherently superior to other flavorful cards. And what does it mean for the flavor quotation when its speaker is not well-known? As it turns out, that means the flavor is hidden. Making the effort to dig it up can be worthwhile and satisfying. So this week, break out your quest counters and prepare to face The Roil. We’re going on a Khalni Heart Expedition! Green creatures don’t get much greener than Khalni Hydra. If you have a ramp engine and some green tokens, you can power out this 8/8 trampling monstrosity as early as turn 3. Entire deck archetypes have been devoted to summoning this thing. And aren’t the green gods of Theros pleased to see such a strapping gentleman?! 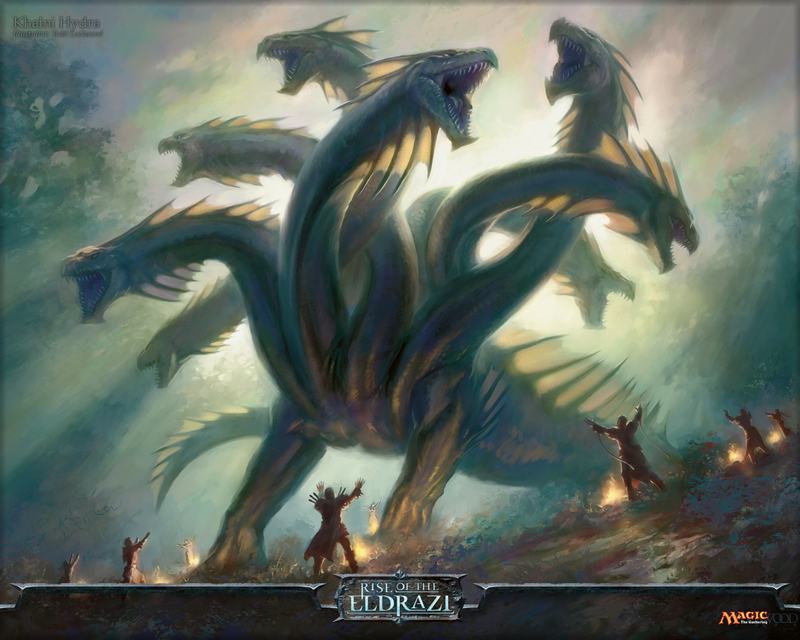 Basically, the Hydra is a powerhouse, an octuple-green trampling monster with a strangely powerful mana mechanic. And for many of us, that’s enough to make him special on its own. But we’re not stopping there. Oh, no. If coins mean more than what they’re worth, cards mean more than what they do. At last, the words I’ve wanted to type for days now. Let’s check out this flavor text. Okay, WHAT?! Time to collect on a debt? Begin the hymns?! What kind of hymns? Who’s singing them? And what kind of crazy Summoner’s Pact did these people make? I’m not sure I’d ever read the flavor text of Khalni Hydra before this week. It’s Khalni Hydra. You don’t play it for flavor. But this story feels totally crazy, even ominous. It spans entire eons. Basically it allows us to peer into the history of Zendikar a little more deeply. Let’s start with where we are on the plane, and what that means. This story is set on the volcanic Zendikari content of Akoum. Yup, the one from Akoum Refuge. Volcanic waste as far as the eye can see. Not really what I’d expected from the greenest creature ever. But it turns out that some of Akoum is verdant and lush, thanks to the chaotic behavior of mana on Zendikar, called The Roil. The Roil often sparks unchecked supernatural growth here. These flashes of growth, called “Life Blooms,” usually last a couple of years and then peter out. With one notable exception. Ora Ondar, “The Impossible Garden,” has lasted a century and shows no signs of shrinking. The people of Ora Ondar (mostly elves) have dedicated their lives to preserving its verdant beauty. I’m sure they do a lovely job and all, but they’re not the main reason this garden exists. Unbeknownst to the denizens of Akoum, this font of green mana is fed by the Khalni Stone. Aha! Now the name makes sense! Although honestly, the people who have summoned Khalni Hydra are unlikely to call it that themselves. We as players have been let in on a sort of dramatic irony. We know that an ancient artifact of enormous power stabilizes the Life Bloom here, but they don’t. They worship the land, even eating some of its rare mana-infused fruits religiously. As for the bargains being struck and promises made, it’s important to note that this is not a card from the Zendikar set. 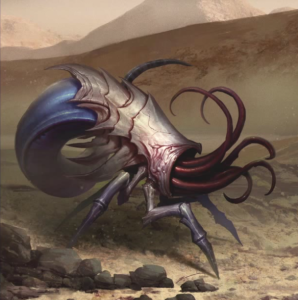 It’s from Rise of the Eldrazi. Ora Ondar is in danger. Truly, all of Zendikar is in danger. To protect themselves, the people of the settlement must gather to summon the Hydra, and quickly. Mechanically, this makes sense. It takes a ramp deck to cast most Eldrazi. But a ramp deck with the Khalni Hydra strategy can focus on spamming creatures early, and then get their mana back when the hydra hits play. That strategy might seem slow and stompy, but it still undercuts the Eldrazi player. More so if you’re dedicated, just like the people of Ora Ondar. I love Magic. It tells so many great stories. And making the effort to uncover hidden stories can prove most rewarding of all. I still feel frustrated by some aspects of this card’s flavor. Mostly the deal-making part. But in my search, I’ve found rare fonts of mana, volcanic peaks, and some very devoted humanoids (just to name a few things). It’s been worth it. That’s what I’ll come away knowing. Spec note: People seem to be leery about this card getting reprinted in fall. It’s down from $20 to around $13. But honestly, it’s been around a $20 card for the past year and a half. I don’t anticipate Khalni Hydra‘s price dipping much lower, even in the event of a reprint. He’s what you call “eternally playable.” As long as there are cheap green ramp dudes and Plant tokens (shout-out to Khalni Garden! ), there will be a place for Khalni Hydra. Thanks for questing with me, you guys. I’ll talk to ya next time. This entry was posted in Uncategorized and tagged Emily, flavor text, Khalni Hydra, MTG, MTGFinance, MTGSpeculation, MTGTCG, short story on July 8, 2015 by Emily Smith. Whether you chuckle, roll your eyes, or nervously scan your cubicle for Goyfs, the above flavor text (often shortened to “Ach! Hans, run!”) is among the most memorable, most emotional, and even the most ridiculous flavor text snippets of all time. 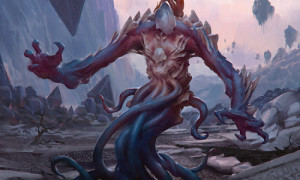 Even if you haven’t been playing Magic for very long, you’re probably well-acquainted with at least one “Creature – Lhurgoyf.” Whether you rue the day Tarmogoyf saw print, or you thank the MtG gods that your Zoo deck can hit so hard on turn 3… I guarantee that Lhurgoyf is ultimately responsible. Lhurgoyf was a four-mana creature, weighing in at 2GG. Its power was the number of creatures in graveyards, and its toughness was that number plus one. A complex mechanic. Yet oh, so grokkable. Sure, Lhurgoyf wasn’t exactly a competitive card at the time *cough cough Necropotence*. And it didn’t become a competitive card, ever. But Lhurgoyf was such an R&D home run for Wizards that I’m going to declare it the single most influential card in the set. That’s a bold move, I know. But stick with me. Lhurgoyf was never really intended to be a long-lived creature type. In fact, when it was first printed it was a Summon card, “Summon Lhurgoyf.” This came from an era when we still had oddities like “Summon People-of-the-Woods” and “Summon Nameless Race.” But players loved this card! They loved it for all the reasons we still love it today. The “growing with the graveyard” mechanic. 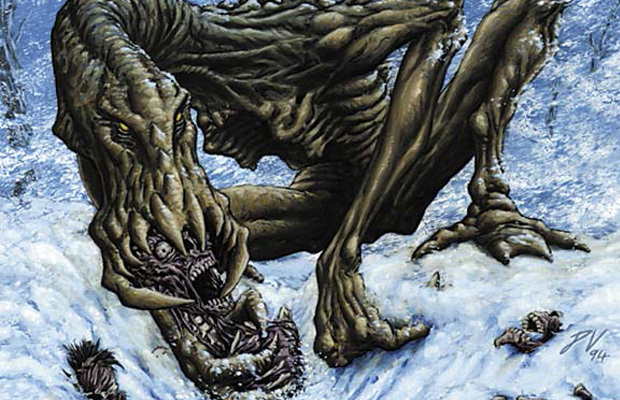 That crazy art with the rangy limbs and gnashing teeth (thank Pete Venters for worldbuilding through his art in those days). And of course, the text! In 7th Edition… a curiosity! A creature called Revenant came out, a black Spirit with flying. It had Lhurgoyf’s creature mechanic, but only for your own graveyard, and without the +1 to toughness. Seems a little underpowered, even for creatures back then. But then there’s the flavor text. 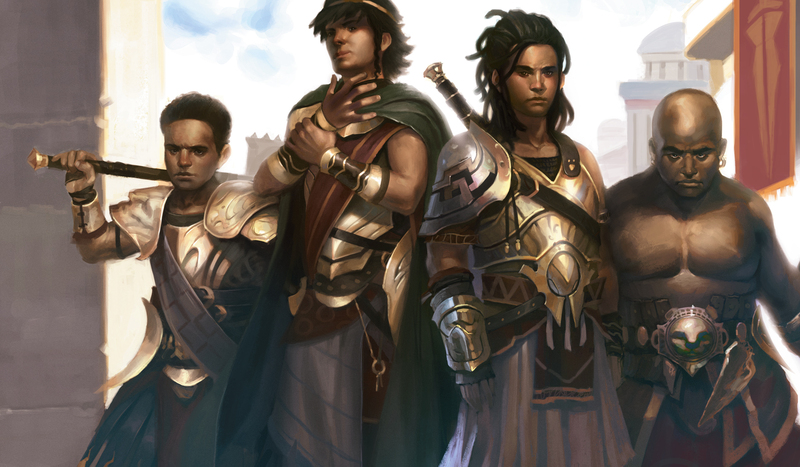 Lhurgoyf’s next aftershock of influence came in Odyssey, with the five-color cycle of Goyfs. Each keyed onto a card type its color liked. In WUBRG order, that was enchantments, instants, creatures, sorceries, and lands. They also had a keyword ability primary for their color (vigilance, flying, regenerate, haste, and trample). Magnavore saw a 9th Edition reprint, and Mortivore is perennially popular with kitchen-table players. He tends to get the biggest of them all, and regen is just good. It’s doubtful that too many of you remember Cantivore, Cognivore, Mortivore, Magnavore and Terravore. 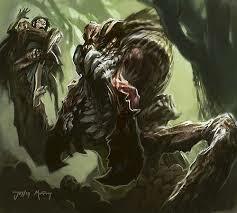 Maybe if you play Commander, you’ve seen Mortivore lurking around mill decks from time to time. But these guys were all the next generation of Goyfs, and they all sport a variation of the classic Goyf physique, with hallmark gangly limbs and enormous teeth. The Lhurgoyf saga continues, and likely concludes, with Time Spiral block. At last Wizards decided to give us the lady whose cry of alarm inspired it all: Saffi Eriksdotter. But was “Ach! Hans, run!” really her “last words”? A time rift. Our Saffi went through a time rift. Perhaps she’s survived after all. Yet her card’s mechanical design seems to signal a thumbs-down for that hypothesis. You can sacrifice her to make sure that a creature that would be destroyed, returns to play. Maybe that means she gave up her life for her brother. Maybe it’s intended to show the chaotic nature of time rifts themselves. Or maybe she was meant to be played WITH Tarmogoyf. Look at their art side by side. Their original art, in Goyf’s case. On the left, Saffi flees, glancing backward in terror. 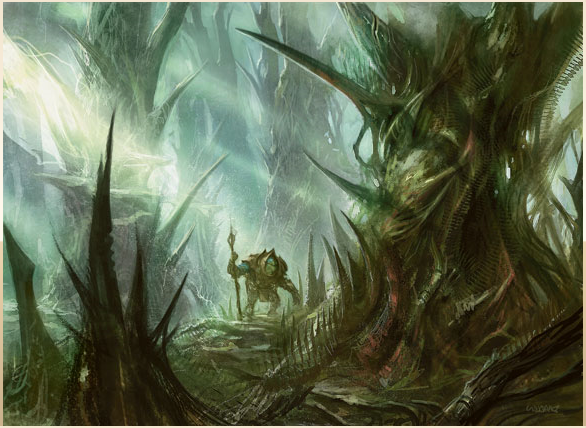 On the right, Goyf holds a familiar-looking human in one gnarled claw. It could be Saffi’s alternate past, or her inevitable future. It could be Hans. In a typical GW Zoo sort of build, you’d probably see yourself saccing Saffi to save Goyf pretty regularly. The overall picture looks grim from where I’m sitting. So this is the pinnacle of Goyf. We’ve gone from one type of card in the ‘yard, to EVERY type of card. We’ve gone from a flavor snippet of text on a random one-off creature brewed up for fun, to visible art references between two viable, competitive cards. It paints a fitting, though terrifying picture. A serviceable end. But in my heart of hearts, I wonder… who is Hans Eriksson? And when will he get his revenge? On the spec side of things, green and white look strong in Origins, and Goyf is still somewhat down. See if you can build a Saffi recursion engine into your little-kid aggro Wilted Abzan. There’s never been a better time. But even when you’re shelling out for a playset of Goyf… sometimes coins mean more than what they’re worth. And sometimes cards mean more than what they do. This entry was posted in Uncategorized and tagged Emily, flavor text, gofy, MTG, MTGFinance, MTGO, MTGSpeculation, MTGTCG, short story, tarmogoyf on July 2, 2015 by Emily Smith.